This 100% acrylic knit hat is gray with a black band around the opening. 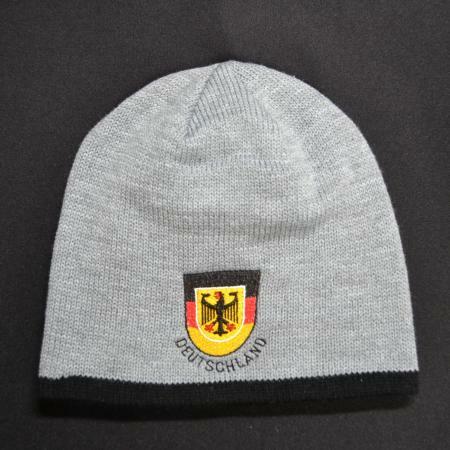 Embroidered by Ernst Licht at our Oley, PA store with a German shield and “Deutschland” embroidered across the bottom. Hat imported. One size fits most. Deutschland beerstein bottle opener with a magnet on the back. Imported from Germany. 3″ x 5″ Made in the USA. Stand is for display purposes only. Self sticking 3D “A” decal. Measures 3″ from left to right and 2″ from top to bottom. Besides being a great talking piece, this deer foot bottle opener is a great gift item and will be sure to be the center of attention. Approximately 9 inches long. Made in Germany. Plastic handle. Imported from Germany. A small purse replicated to look like lederhosen, with edelweiss embroidery.